Description: To 140cm long. A long, somewhat slender snake. It is unusual in that it has keeled ventral scales, which help it to climb trees. Body is green to greenish-yellow on a black background. Color is greenish below. 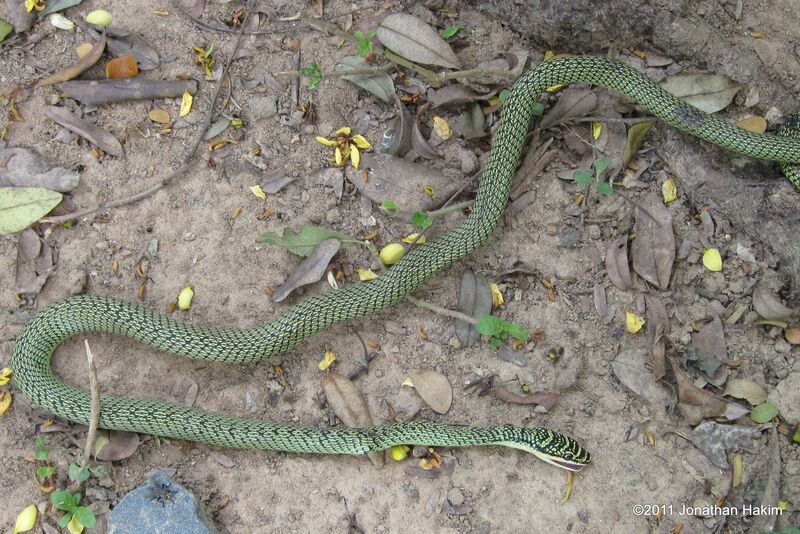 Similar Species: Whip snakes (genus Ahaetulla) have a characteristic pointed snout and more slender bodies. 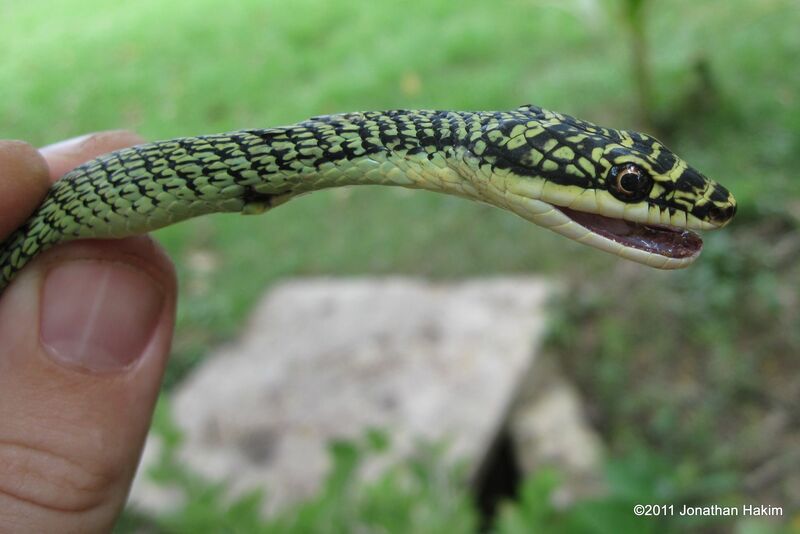 Green vipers (genus Cryptelytrops) have a triangular head and pits behind their nostrils. Habitat: Naturally a forest species, but has adapted well to agricultural areas, parks, and even yards and gardens. Can climb to significant heights in trees. 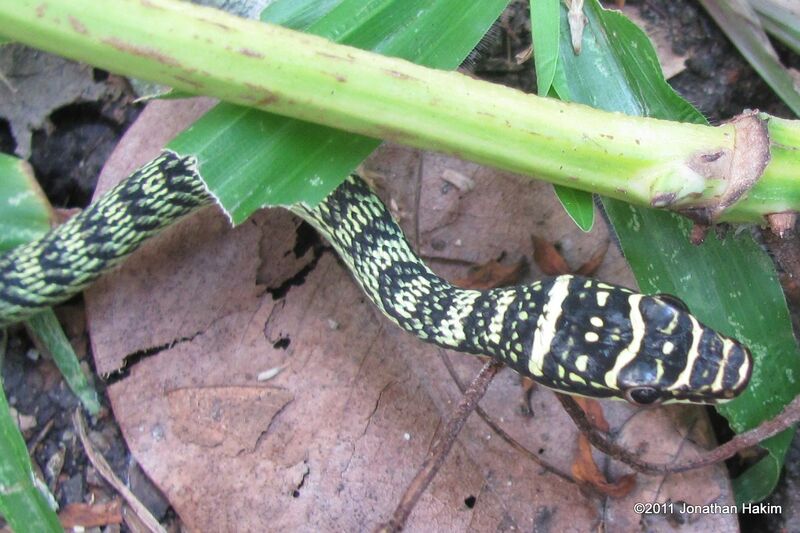 Contribution to the ecosystem: This snake helps control Bangkok’s rodent population by feeding on mice and small rats. It also eats bats, lizards and smaller snakes. The juveniles provide food for birds of prey and larger snakes. Danger to humans: The Golden Tree snake bites aggressively when captured and is another one of Bangkok’s mildly venomous rear-fanged snakes, but its venom appears to pose no danger to humans. One should always be careful not to confuse it with the more venomous Green Tree Viper. Conservation status and threats: No known conservation issues. 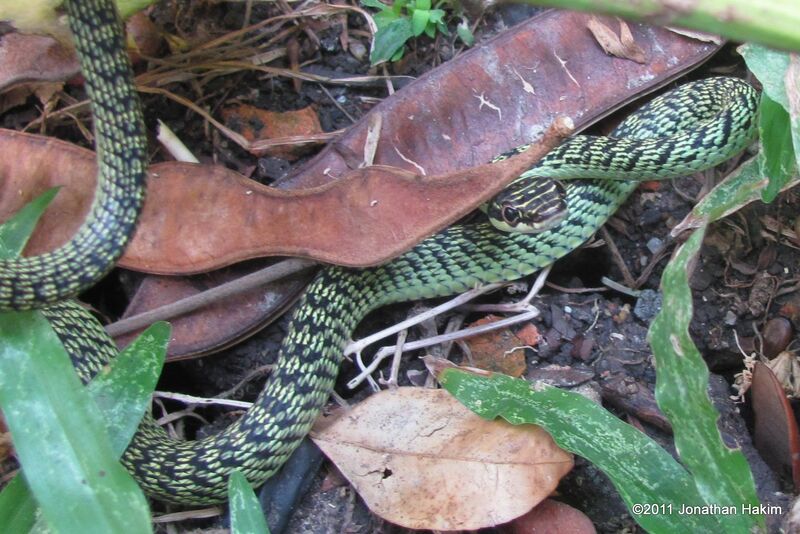 This species has adapted well to human encroachment and is one of Bangkok’s more common snakes. However, they are often killed by humans who mistakenly believe them to be dangerous. I found a dead adult Golden Tree Snake on the outskirts of Phnom Penh, Cambodia that appeared to have been killed by a human. Interesting facts: The Golden Tree Snake is one of the few “flying snakes”. These snakes cannot actually fly, but glide to some degree by flattening out their body, forming a U-shaped cavity with their underbelly, and twisting in the air as they jump from high branches. It is believed that this behavior is used to move about the forest, catch prey, and as a defense mechanism against predators. They can cover as much as 100m in a single leap.